San Marzano tomatoes are beloved by foodies and chefs around the world as the best tomatoes for sauces and pastes. Let's learn what makes these tomatoes so different from the other cans on the shelf. According to legend, San Marzano tomato seeds were a gift from the King of Peru to the King of Naples during the mid-1700s. The King of Naples planted the seeds in the shadow of Mount Vesuvius near ancient Pompeii, where the rich volcanic soil helped produce the perfect plum tomato. Now Peru wasn't a kingdom at the time, so this tale seems to me more legend than anything. That a humble tomato would cause people to spin such stories, however, is a testament to its extraordinary flavor. San Marzanos have a few distinguishing qualities, which make them so perfect for sauces. The flavor is sweeter and less acidic than the most tomatoes. It has fewer seeds and is easier to peel. During cooking, the high density and pectin level helps the sauce to cook down quickly, preserving the flavor and bringing out the tomato's sweetness. The San Marzano tomato's flavor is due to genetics and the specific way it is grown. The volcanic soil mentioned in legend actually does play a part in the flavor of the tomato, and makes the taste different from the other regions of Italy growing similar seeds. Great care must be employed when working with the plant and fruit. The plant is very delicate and must be staked up quite carefully. The tender fruit must be picked by hand. The genetics of the plant are closely monitored, and DNA testing is used to establish a true San Marzano plant. This is necessary because the tomatoes have a high value, and people sometimes sell fraudulent San Marzanos. This iconic tomato is protected by the D.O.P. label of Italy, which means Protected Designation of Origin (Denominazione di Origine Protetta). To attain the San Marzano D.O.P. 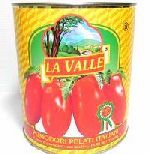 label, the tomatoes must have proven San Marzano genetics and be grown within the Valle del Sarno region. Considering how easy it is to grow a tomato, it appears that a lot of fuss goes into these particular tomatoes. But any true Italian understands the desire for a perfect and authentic sauce. Thus the fuss over the saucey champion of tomatoes � the true San Marzano. Article provided courtesy of the Pennsylvania Macaroni Company, a Pittsburgh-based importer of Italian foods, including gourmet cheeses, authentic pastas, and much more (including San Marzano tomatoes of course).